Looking to get the most out of your study sessions? 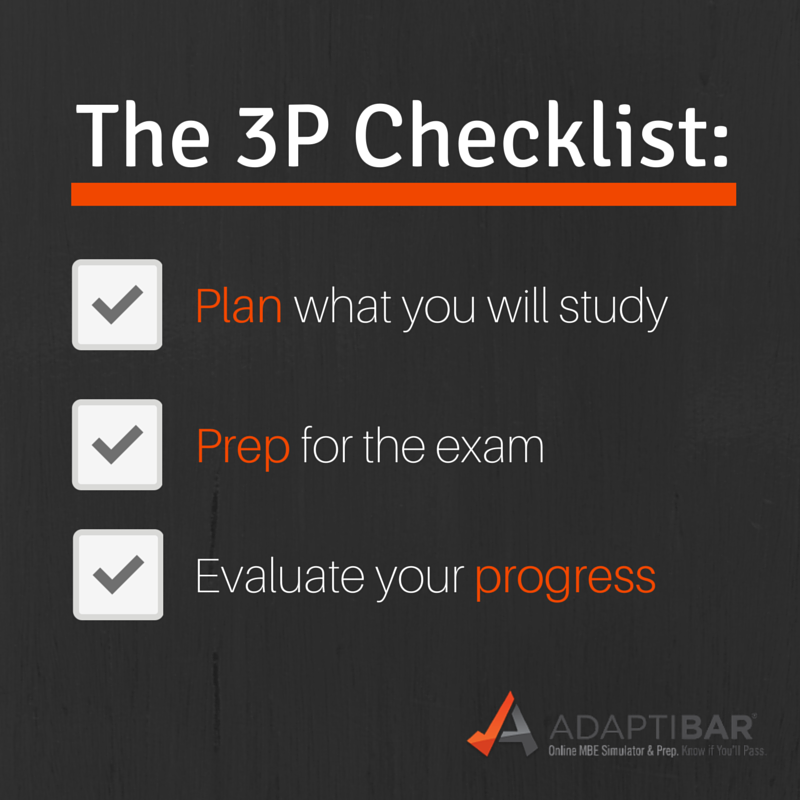 Follow these tips to increase productivity while prepping for the bar exam! Schedule Smart – What time do you feel most energized? The answer to this question varies by each individual and is dependent on a variety of factors, from sleep schedule to daily activity level. Pay attention to your body’s natural time clock and identify when your energy peaks throughout the day, then plan your study times accordingly to maximize efficiency. Some general guidelines to follow are that people are generally more productive within 2 hours after a workout or 1-3 hours after drinking caffeine. Stop Multitasking – According to the American Psychological Association, switching between tasks can reduce productivity by up to 40%. Therefore, avoid eating, listening to music, or watching TV while studying to ensure that your brain retains maximum information during your study sessions. Clearing your desk of clutter and study materials that are not relevant to the day’s learning can also help boost concentration by forcing your brain to focus on just one thing. Follow the ‘20 Rule’ – No matter if you spend most of your time studying online or offline, concentrating on bar prep for hours at a time can be both physically and mentally exhausting. To keep your mind actively alert and reduce eye strain, follow the ’20 Rule’. This technique simply requires you to focus on an object every 20 minutes that is at least 20 feet away for 20 seconds. Mixing up your study technique from time to time can also be beneficial by ensuring that your mind is not focused on one thing for too long. For example, if you study one day with AdaptiBar on your mobile device, spend the next day reviewing outlines or rereading question explanations on paper. Take Smart Breaks – Taking time to do things that you enjoy is crucial to avoiding bar exam burnout. 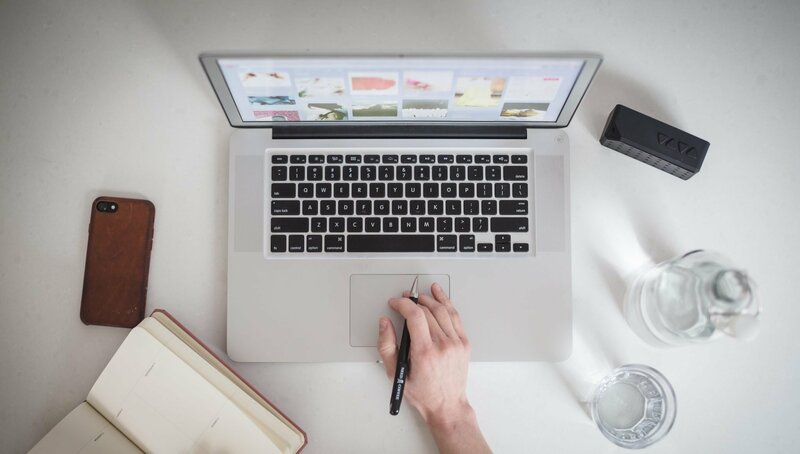 However, making sure that your free time is dedicated to activities that promote rest and overall well-being will be the extra step that sends your productivity skyrocketing. Instead of snacking on junk food or reading a book, participate in more mindless activities such as exercising, listening to music, or running an errand. Even taking a 10 to 20 minute nap has been found to boost short-term memory, concentration, and energy throughout the day. 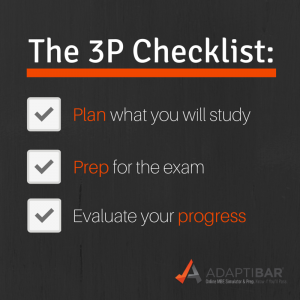 Plan, Prep, Progress – Follow the 3Ps to set goals and maintain focus on your studying. You should begin each day by planning what you will study by making a general outline of your daily goals and how you will achieve them. This outline will serve as your guide to how you prep throughout the day. Once you have finished studying, be sure to complete the final step by checking your progress. Did you successfully achieve your goals? If not, don’t dwell on your shortcomings but rather focus on evaluating how you can improve tomorrow. Time Yourself – Competition is a great motivator, and it has even been known to improve performance. So, why not engage in some friendly competition with yourself? On the bar exam you will have approximately 1.8 minutes to answer each MBE question, meaning that you should be able to answer about 10 questions every 18 minutes. Use AdaptiBar’s program timer as you prep for the MBE, tracking your progress as you go. You may be surprised at how much longer you are able to concentrate by giving yourself a deadline! What kind of blog posts would you like to see next? Tweet us @adaptibar or comment below for suggestions and we may just write about it next!